There are four bands named Dungeon: a Heavy Metal band from the USA; a Power Metal band from Sydney, Australia; a Thrash Metal band from Bras?lia, Distrito Federal, Brazil; and a black metal band from Italy, who recently became active again. Dungeon's (Australia) 16 year long history began in August 1989, in the outback town of Broken Hill, the home of Mad Max. What started as humble jam session in a high school hall eventually turned into a world-class, international touring machine and one of the biggest Australian heavy metal bands of all time. Dungeon's (Australia) 16 year long history began in August 1989, in the outback town of Broken Hill, the home of Mad Max. What started as humble jam session in a high school hall eventually turned into a world-class, international touring machine and one of the biggest Australian heavy metal bands of all time. Formed by singer and guitarist 'Lord' Tim, Dungeon relocated to Sydney in 1992 and eventually singed a world-wide publishing deal with BMG Australia which led to the release of the Changing Moods demo EP (featuring drumming virtuoso Virgil Donati). The EP gained the attention of Japanese label TDK-Core Records who convinced the band to release the Changing Moods songs, plus other demo material exactly as it was under the name of Demolition. Although the band was unsure of this idea, the album eventually sold over 6,000 copies within the first six weeks and established a solid fan base in Japan. Dungeon, whose lineup now consisted of Lord Tim, Dale Corney (guitars), Justin 'Juz' Sayers (bass) and Steve 'Stevo' Moore (drums), began to take the Australian metal scene by storm with their high-energy, technical shows. 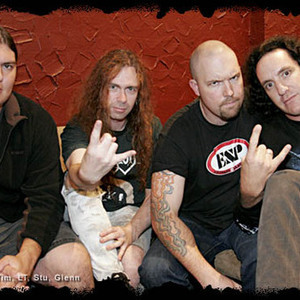 The band's first official album, Resurrection, was recorded which further raised Dungeon's profile and along with new bassist Brendon 'Dakk' McDonald, Dungeon embarked on tours with Yngwie Malmsteen and Nevermore, as well as at festival appearances such as Metal Warriors Metalfest, Bloodlust and Australia's largest metal event, Metal For The Brain (where they subsequently appeared every year since then, headlining in 2003). With the release of their ground-breaking 2002 release, A Rise To Power, Dungeon went from strength to strength with national tours with Edguy, Doro and Destruction, and another change of guitarist with Stuart Marshall taking over from Dale Corney. 2003 was a landmark year for Dungeon, who signed a priority deal with heavyweight metal label, Limb Music Products, coinciding with the band's first international tour to Japan's prestigious Club Citta for the Melodic Metal Festival alongside Skylark, Vigilante, Dragonland and Galneryus. The commemorative album, Rising Power, was released for this tour and a DVD and live CD entitled Under The Rising Sun was created from the tour footage. In 2004, Dungeon began recording the follow up album to A Rise To Power entitled One Step Beyond, and also simultaneously re-recording their 1999 debut, Resurrection with the current line-up and modern production values for a proper world-wide release through LMP. During this process, Dungeon embarked on a promo tour through Japan, Europe and the USA and Australian tours with Mayhem, Opeth and Edguy once again. This busy year saw Dungeon's profile raised to one of the biggest metal bands in Australia, but further line-up changes lay ahead. 2005 - Dungeon's 16th year - and it was the biggest and busiest yet, beginning with tours with Nightwish and Angra, the worldwide release of One Step Beyond and Resurrection, and an Australian tour with metal gods, Megadeth. So impressed with Dungeon's performance on this tour, Megadeth main-man Dave Mustaine invited Dungeon to join them on their European tour, which conveniently coincided with Dungeon's own planned tour of Europe and Japan. The tour, which led from Holland to Germany, Serbia, Romania and Greece, with the new line-up of Lord Tim, Stuart Marshall, Glenn Williams and Tim Yatras, was an outstanding success and even included headlining shows in Belgium, Holland's RosRock festival and an appearance at the prestigious Bang Your Head pre-show alongside Metal Church, Chris Caffery and Nasty Savage. Dungeon's journey continued through Canada and then onto Japan for a headlining tour and clinics at The Musicians Institute across the country. Dungeon returned to Australia exhausted but immediately returned to the stage for a tour with Fozzy. The touring stress had taken its toll and the band was about to suffer its final line-up change. Dungeon announced that Stu and Glenn would be leaving the band, and that Lord Tim had chosen to dissolve Dungeon and concentrate on LORD, which was originally a solo side-project, but would now continue on as a full band where Dungeon left off. The final Dungeon album, The Final Chapter, was released in 2006 and concludes the Dungeon story after 16 years and an impressive portfolio.